The millennial workforce has become the backbone as well as the future of business on a global scale, with the consumer market as well as the business arena becoming increasingly millennial-driven, and millennial-owned. Every sector, every level of operation, as well as every process in a modern company is changing and morphing into something truly appealing for the modern day employee. And office designs are leading this change that will drive up productivity, performance, loyalty, and employee happiness. Here are the principal changes you should introduce into your office space in order to refurbish the work environment the millennial way. The keyword you are looking for here is work-casual, depicting the laid-back yet productive and creative setting that primes a millennial’s brain for performance, inner peace and satisfaction, without the negative effects of a rigorous office setting of old. While fear might have been the key driver of performance decades ago, nowadays the young workforce only responds to positive reinforcement. So instead of sticking with the outdated “cubicle” mindset, think about knocking down a wall or two, and creating plenty of space for impromptu meetings, and utilising glass walls in order to create a sense a freedom and allow the employee to feel less claustrophobic during the day. In essence, the new office setting aims to deconstruct old norms and allow the millennial to feel free in order to do their very best. More often than not, you will see a modern work environment boasting vibrant colours on the walls and furniture. While this might seem like an unintentional spur-of-the-moment addition in an otherwise serious business setting, in reality, every colour has its meaning and purpose in the office. The idea is to surround the employee with hues that will not only elevate their mood and decrease stress levels, but also prompt them to achieve maximum productivity during their time in the office. So instead of keeping your white or grey walls, think about the colours you can introduce that will positively influence the employee mindset and allow positive vibes to permeate the space. The modern world is rapidly embracing the nomadic way of life, with entrepreneurs as well as employees becoming more detached from offices and spending more time doing work on the go. The online universe we currently inhabit has made this possible without the slightest hitch in communication and productivity. Yet innovative businesses are coming up with effective solutions to keep the employee coming to work on a daily basis. 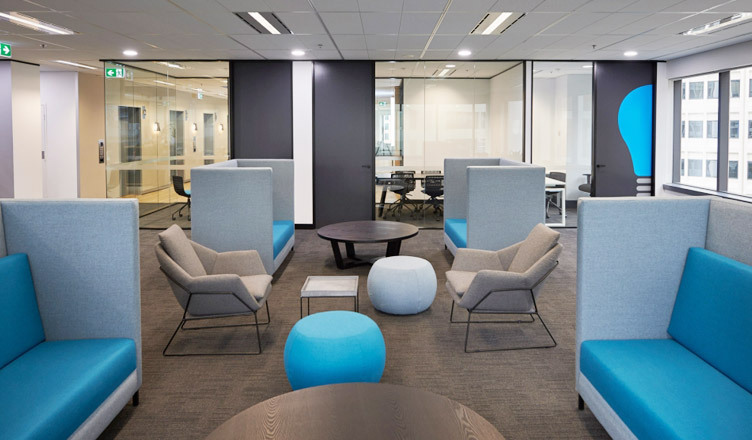 This is achieved through modern office refurbishments that demonstrate that the use of comfortable, ergonomic furniture along with layers and textures that bring a homey vibe to the setting can create a home away from home for the modern employee. From entertainment areas, to fitness studios and rec rooms, as well as leisure areas and even rooms where the employee can take a well-deserved nap, these spaces contribute greatly to the overall performance in the office. Everyone knows about the famous interior trends going on at Google, with offices graced by slides, trampolines, and bean bags. But the gimmick is now over and millennials are taking a more serious approach to office furniture. While a slide is always welcome, it is the beautifully styled, ergonomic, and eco-friendly furniture that millennials are actually after. The key is in bringing together form and function in the workplace by introducing modern furniture that allows freedom of movement, easy manoeuvrability, and also safeguards the physical and mental health of the employee – such as a standing desk or a kneeling chair. Millennials belong to the species of digital natives – they were born into the digital world and they did not have to embrace technology, as it was already an inextricable part of their being. This is why modern businesses are encouraged to embrace millennials’ love for tech by introducing equipment and gadgets such as dual-monitor setups, laptops and notebooks, wireless peripherals, and much more. While it might not have been the first thing that came to mind, restructuring the tech layout in the office is an essential step in creating a well-organized work environment where young minds can strive for success. Modern office design has seen major changes aimed at getting the most out of its employees through positive influence, reward, and encouragement. With these five valuable insights you will have no problem refurbishing your office the millennial way. As a senior digital marketing consultant, Lillian Connors believes that the question of business goes far beyond the maximization of profit through different money-grabbing ploys. Instead, she likes to think that ethical principles should be at the core of every commercial venture, paving the way for much more balanced distribution of wealth on a global scale.